Composure Chews are for dogs exhibiting nervousness, hyperactivity, anxiety or responding to environmentally induced stress. It contains three main ingredients to support calming in dogs: C3 colostrum calming complex, l-theanine and thiamine. 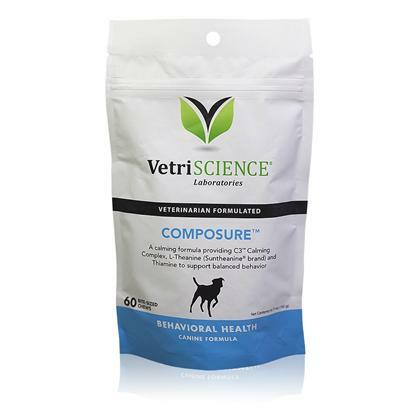 Unlike other calming formulas, Composure Chews won't effect your dog's energy level or personality. You can give them to your pup without worry. Composure can be used either as needed or on a daily basis for ongoing support. During times of increased stress it is safe to double or triple the above amount, as needed.